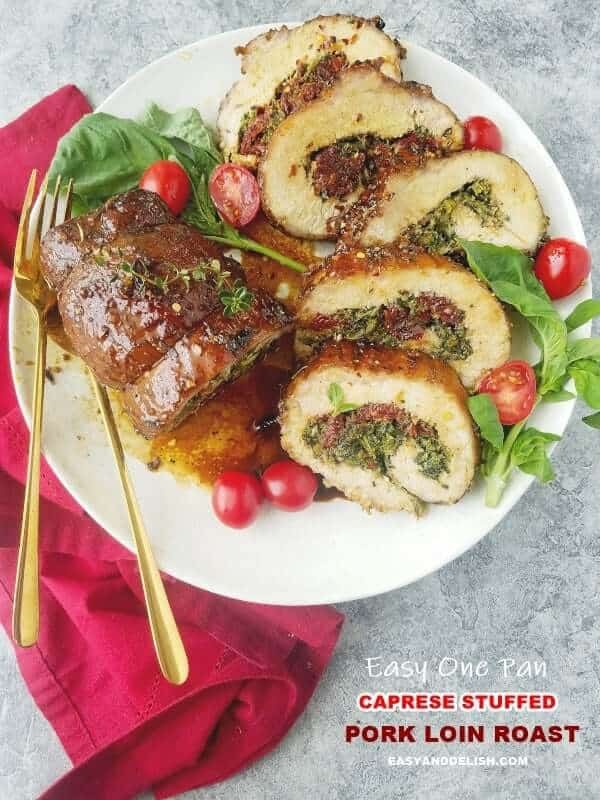 Stuffed Pork Loin Roast perfectly seasoned, stuffed with sun-dried tomatoes and a creamy spinach basil spread, and topped with a honey mustard sauce. THE BEST roast ever! 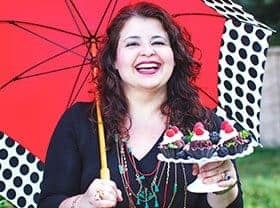 Although I am Brazilian, my family could easily be confused with a traditional Italian family — loud and joyful! And so it was with our Sunday meals down in Brazil. 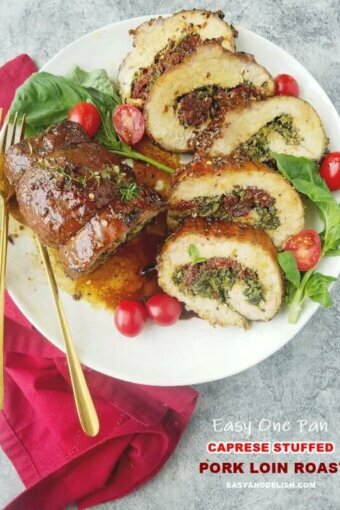 I decided to revive those moments with this Caprese Stuffed Pork Loin Roast. Last Sunday it was the centerpiece of conversation of my present family of four … and brought us all great happiness. The stuffing was inspired by one of my favorite salads, Caprese — which is made of tomatoes, fresh mozzarella and basil. Like pizza Margherita, another favorite of mine, the stuffing has all the colors of the Italian flag. But that’s not all! A tasty honey mustard sauce glazes the top beautifully, giving the roast a nice golden color. It’s a feast for the eyes and, above all, for the palate. Furthermore, it’s keto, low carb, and gluten-free… and made in one pan. Now tell me: what else could you wish for? So, grab a baking pan and come to the kitchen. Your loved ones will thank you later. First, butterfly pork loin on a cutting board (pic. 1); place plastic wrap on top and pound with a hammer until flat and thinner (pic.2). Second, layer sun-dried tomatoes on top, leaving a 2-inch border on both of the opposite long ends (pic.3); set aside. In a food processor, blend spinach, basil, oil, seasonings, and cream cheese until smooth. Spread on top of the tomatoes (pic. 4). Roll long ends away from you, pressing firmly to create a tight roll, ending with seam on the bottom. Tie 6 to 7 strands of kitchen twine around roast very well. Transfer to a rack set over a roasting pan. Preheat oven to 450 F.
Meanwhile, mix honey, mustard, vinegar, oil, and seasonings in a small bowl. Then brush mixture all over Pork Loin Roast. Roast for about 15 minutes; then decrease temp to 350 F and cook for 30 minutes (or until internal temp reaches 145 F). Let rest for at least 10 minutes before cutting twine off and slicing. Enjoy! Can’t get enough pork loin? 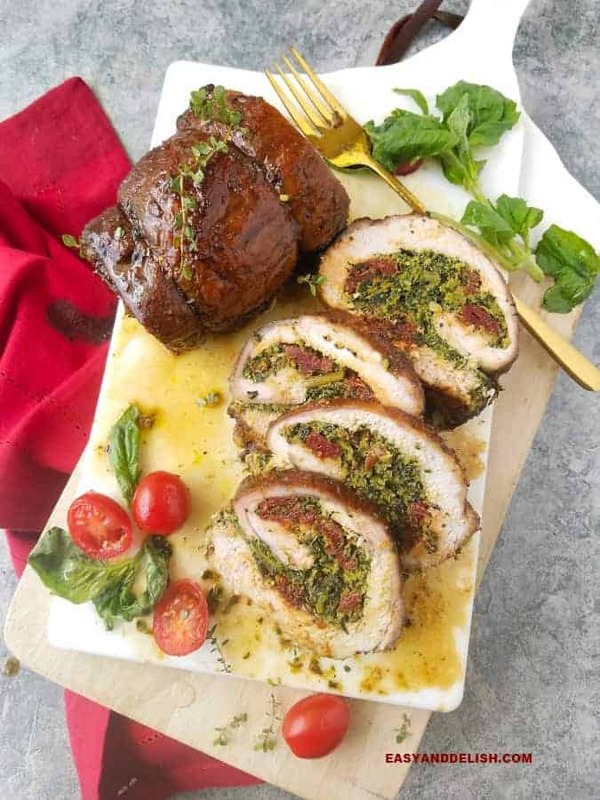 Try our Garlic Pork Loin with Wine Sauce. 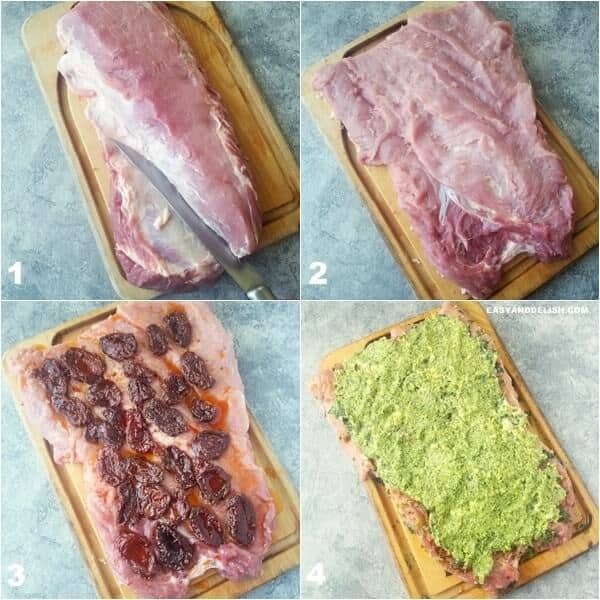 So avoid loin roasts that are pale in color (off-flavor taste) or that have dark spots on the fat (spoilage). May I Replace Pork Loin Roast with Pork Tenderloin? No! They are different cuts. Pork tenderloin is thinner and longer, and must be quickly cooked over high heat. On the other hand, pork loin is a larger cut and is best slow-roasted or grilled. That is why our Caprese Pork Roast is first cooked on high temp to get a good crust, and then the temp is lowered. Leftovers must be refrigerated and consumed within 3-4 days. Use them in sandwiches, casseroles, or chop into chunks and top pizzas. You can use thinly sliced fresh tomatoes instead of sun-dried tomatoes. Creamy goat cheese is also a great sub for cream cheese. First, butterfly pork loin on a cutting board; place a plastic wrap on top and pound with a hammer until flat and thinner. Second, layer sun-dried tomatoes on top, leaving a 2-inch border on both of the opposite long ends; set aside. In a food processor, blend spinach, basil, 1 tbsp oil, 1/2 tsp salt and 1/2 tsp pepper, and cream cheese until smooth. Spread on top of the tomatoes. Roll long ends away from you, pressing firmly to create a tight roll, and ending with seam on the bottom. Tie 6 to 7 strands of kitchen twine around roast very well. Transfer to a rack set over a roasting pan. Preheat oven to 450 F. Meanwhile, whisk honey, mustard, vinegar, 2 tbsp oil, 1/2 tsp salt, and Italian seasoning in a bowl. Then brush mixture all over pork loin roast. Roast for about 15 minutes; then decrease temp to 350 F and cook for 30 minutes (or until internal temp reaches 145 F). Make sure to leave roast out of the fridge for about 1 hour before cooking -- to ensure more even cooking. Store leftovers in the fridge for up to 3-4 days. You may use in sandwiches, casseroles, or chop it up and top pizzas. Your pork roast looks delicious. I make a turkey dish that is similar so I can’t wait to try this version, I know it will be terrific. Pork roasts are great — full of flavor, and easy to make. Terrific looking recipe — definitely need to make this. Thanks! The spinach stuffing just shouts spring! What a delicious way to enjoy pork.